A while ago I signed up for Ning a service which lets you create your own Social Website without coding (well you can even code PHP if you want to). I never used it until I received an email tonight, that Ning has added new templates which make the creation of your own site easier. They added Ning Videos, Ning Photos and Ning Group. I like the wizard driven approach of creating the site. However adding the actual photos seemed tedious (no client uploader utility). I would have liked to just add my pictures from Flickr, but there was no obvious way to do that. Just to get the site started I uploaded some party pics from Tao into a new album. It seems that only I can post into that album, while I would expect that also other users can upload their Tao pictures into the same album. I probably need to dive deper into it. I have also a great idea about creating a custom Ning group. More about that later, but let me know if you know other services you like/use which provide an easy, but yet feature rich way to maintain a virtual group of people (discussion board, photo sharing, calendar, user management, etc.). In short, it allows niche sites to cheaply add community tools to their existing web presence. This could be a precursor to a fund raising effort by the company that has so far been privately funded by Marc Andreessen. In short, it’s not about one company owning a space – video, or social networking, or photo sharing. It’s about letting anyone have these kinds of services. That’s biting off a hell of a lot, and there is much to prove, but if the planets align, I have to say, it’s an impressive play. Karen mentioned to me the other day that she saw this really cool video on Yahoo! with a guy jumping multiple poles with his bike. Little did she know that my friend Volker, who is now one of the youngest executives at Siemens, used to be the Northern German champion in Bicycle Trial. That’s actually how I learned this sport exists. It is absolutely amazing and I am still suprised how few people know about it. The stunt of the guy in the Yahoo! video was small compared to tricks I have seen at Trial championships. The goal in Trial and Mountainbike Trial is to finish an obstacle course without having your feet touching the ground (the time you need is not that important). Here is a short clip to wet your appetite. The Spanish have dominated traditional Trial, using specific bikes typically from Monty, for a long time. Well, you think you have seen it all? These kids from England defy gravity. Try at your own risk! Talking about Internet Video… Robert Scoble is launching the Scobleshow tonight. 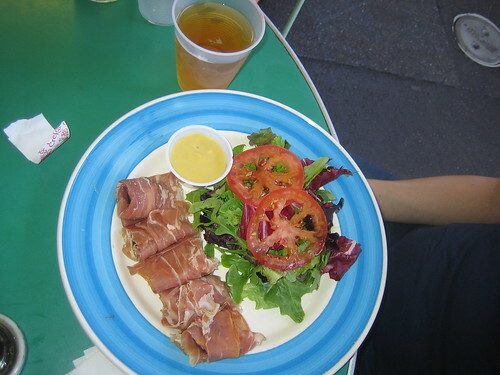 Sorry for my blog posting pause. I am suffering post TechEd Las Vegas Stress Syndrom… which means I had a pretty bad cold. I just browsed Flickr and found this great picture of me and Robert. Looking forward to see the full video on podtech.net very soon. Also stay tuned for a great story about my participation in the demo jam. I just came back to my hotel room in the Venetian after a long day at the SAP Developer Network day. It was great. Mark, Craig and team organized an excellent event with the right mixture of organized sessions and freestyle activities and meetings. Mark Finnern kicked the event of with references to Burning Man and Foo camp. After that a networking session allowed everyone to meet different members of the SDN community. Juergen, James and I started to get ready for the Flex hands-on workshop. In our two workshops we had about 50 attendees who brought their laptops to install Flex Builder and start developing Rich Internet Applications with Flex. Here is James Ward demonstrating Flex Builder. The hands-on sessions were very productive and we got a lot of positive feedback on the Flex Proof-of-Concept application which we developed with RoundArch (a Rich Internet Application for customer support linking back to an SAP application). 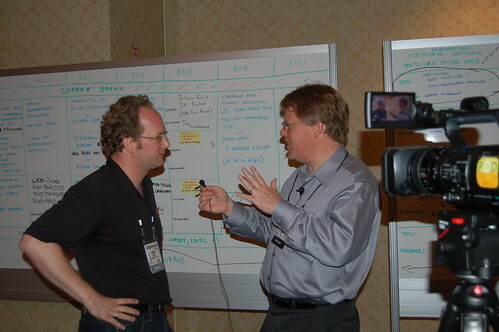 During the breaks I met Robert Scoble and later he did a brief interview with me talking about all the activities between Adobe and SAP. This should be available soon on the SAP channel of PodTech.net). I invited Robert to meet in Palo Alto or San Jose to give him a demo of all the work we have been doing with SAP on improving the user experience. Later in the day Robert also interviewed Shai. We had also a lot of interest in the SDN sessions on SAP Interactive Forms by Adobe presented by Juergen Hauser, Les Woolsey, Blair Powell and Mohan Bethur. We are off to a great start and I expect a lot of people in our sessions and our booth during the next days at SAP TechEd. Finally SDN Day closed with a party at the Hofbrauhaus in Las Vegas. 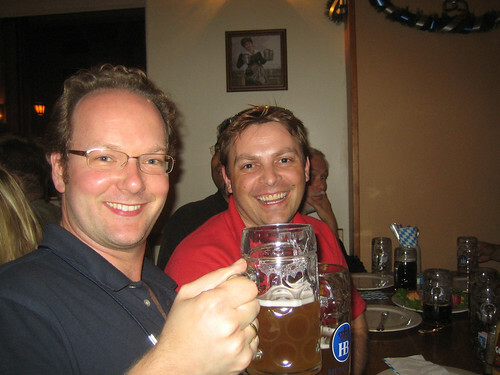 Below is SDNer Harald Reiter and me enjoying a Weissbier. We had a lot of fun on our table and Mark, Craig and Thomas stopped by as well. Its time to sleep and prepare for another big day tommorrow. 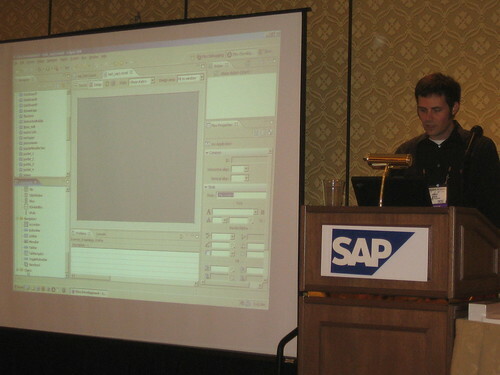 I will present Interactive Forms with Markus Meisl as well as Apollo and the Adobe Engagement Platform as part of the SAP Client strategy presentation. Finally and most importantly I need to mentally prepare for the Demo Jam tomorrow evening. If your at SAP TechEd please support me with a lot of noise! The last days have been pretty hectic. 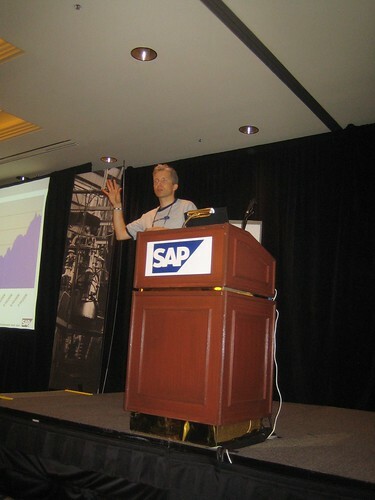 I am getting ready for SAP’s number one tech event the SAP TechEd. This meant installing SAP Web Application Server on VMWare, getting the demos ready, figuring out who needs to go to which workshop, preparing for the Demo Jam and many more things. I am flying to Las Vegas on Sunday and expect a long night since I still need to get an SAP Web AS ABAP server installed on a machine which is hopefully waiting for me in the hotel. I do not have a monitor yet, but hopefully someone can help me out (if you know where I could use a Monitor in the Venetian Hotel on Sunday afternoon/evening please let me know. Even better let me know if you have a box with the Web AS 6.40 ABAP stack which I could use for the SDN workshop). 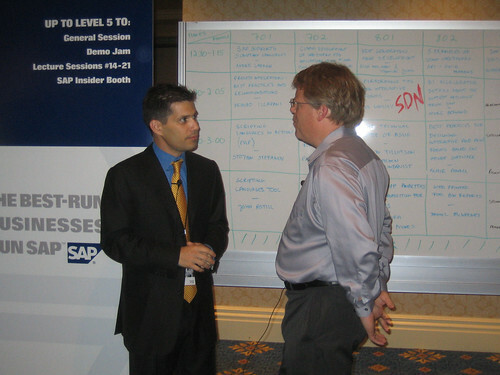 I am very excited to meet Robert Scoble who will be at SDN Day (the SAP Developer Network Event the day before TechEd starts officially). He will do interviews for PodTech (Until today I did not realize they have an SAP Channel, cool!). So here is a summary of the Adobe content at SAP TechEd and SDN Day we have lined up…. Well I better get some rest before the crazy days start! P.S. One more update – I will present the Adobe Engagement Platform and Apollo as part of SAP’s session “Next Generation of Client Technology for SAP“. We are absolutely dedicated to bring rich and engaging user experiences to SAP customers.